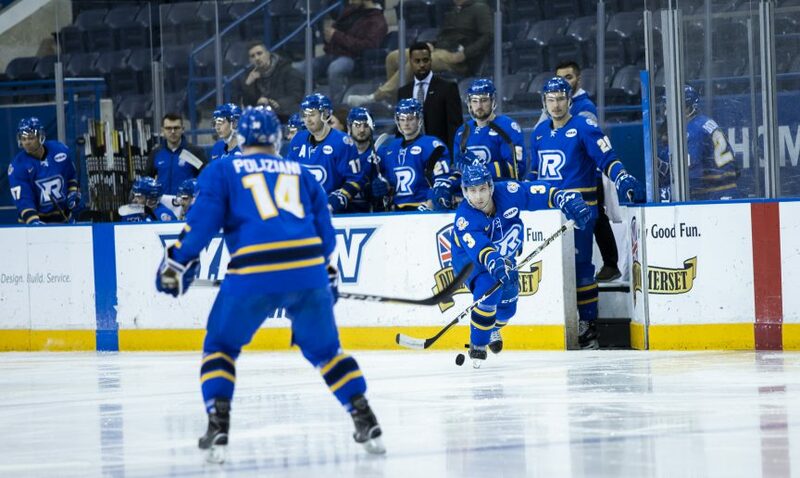 On an exciting, emotional night at a populated Mattamy Athletic Centre on Feb. 2, the Ryerson Rams men’s hockey team narrowly fell to the visiting University of Toronto Blues in a shootout by a score of 5-4. The loss snaps a four-game winning streak for the Rams, while moving their record to 18-8 on the season. Prior to the game, four of the team’s senior players, John Carpino, Vince Figliomeni, Daniel Poliziani and captain Alex Basso were honoured in a ceremony, in which their families joined them and the Rams coaching staff at centre ice to acknowledge their commitment to the squad. After an early Varsity Blues goal from Max Lindsay capped off a physical and jarring first period, the Varsity Blues extended their lead in the early stages of the second thanks to forward Nathan Hudgin. Though the Rams answered back later on in the frame when Carpino, aggressively crashing the Blues’ net, tapped in a Cavin Leth pass to put Ryerson on the board, the Blues made it 3-1 minutes later and carried the lead into the third. Toronto cushioned their lead early in the third when Joey Manchurek found the back of the net, but that was quickly answered by Hayden McCool rifling his 12th of the season through to make it 4-2. 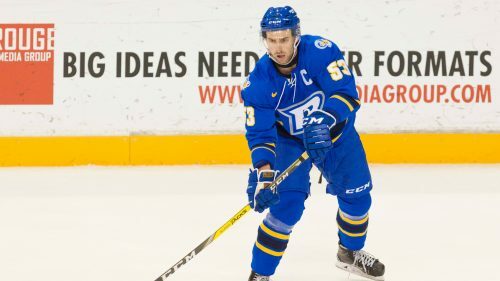 After forward Matthew Santos (fresh off of a three-goal performance Friday morning against Laurier) brought Ryerson within one, captain Alex Basso evened it up with a perfectly placed wrist shot that barely squeaked through Blues goaltender Alex Bishop. Following a tense, yet scoreless overtime period, the Rams ultimately fell after forwards Matt Mistele and Devon Paliani failed to score in the tough shootout against Bishop. UP NEXT: The Rams will travel to St. Catharines to take on the division rival Brock Badgers at the Seymour-Hannah Centre on Feb. 8. Puck drop is scheduled for 7:15 p.m.